The Department of Social Welfare and Development (DSWD) delivered 500 family food packs (FFPs) for distribution to families affected by Typhoon Ompong in Palayan City and Pantabangan, Nueva Ecija. In continuation of the government’s relief efforts to provide immediate assistance to families and individuals affected by Typhoon Ompong, the Department of Social Welfare and Development (DSWD), in coordination with affected local government units (LGUs), already started the registration, profiling and initial assessment of displaced families in evacuation centers. “Our field offices are now doing initial assessment and profiling of individuals affected by the typhoon to determine additional assistance and services,” said DSWD Secretary Virginia N. Orogo. “The Department is also monitoring child and women-friendly spaces in all evacuations centers in Luzon to immediately cater to their needs of assistance,” she added. As of 10 AM report from the DSWD Disaster Response Management Bureau (DRMB), 1,250 evacuation centers in Regions I, II, III, CALABARZON, MIMAROPA, Cordillera Administrative Region (CAR), and the National Capital Region (NCR) are currently sheltering 35,720 displaced families or 137, 994 individuals, while some 4,104 families or 16,191 persons opted to stay in the homes of their relatives or friends in Regions I, II, III, MIMAROPA, and CAR. For the status of response operations, the DSWD Field Office (FO) III yesterday delivered 500 family food packs (FFPs) in Palayan City and Pantabangan, Nueva Ecija, and distributed 200 FFPs to evacuees staying in Dingalan Central School in Aurora Province. In Region II, a team from the DSWD Central Office, FO-II, and Provincial Government of Batanes conducted Rapid Damage Assessment and Needs Analysis (RDANA) in the municipalities of Basco and Uyugan. 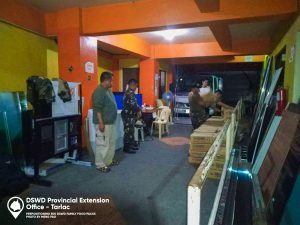 In Ilocos Region, the DSWD FO-I and City Social Welfare and Development Office of Vigan City provided sleeping kits, family kits, and hygiene kits for affected residents in Mindoro Elementary School. Moreover, emergency communications lines were established in Tabuk City, Kalinga and Luna, Apayao by the FO-CAR Rapid Emergency Telecommunications Team (RETT). The total assistance provided by the Department to affected citizens now reached P8,101,581.65, while P1,051,985.00 amount of aid came from LGUs, and P76,950.00 from Non-Government Organizations (NGOs). Today, Sec. Orogo joined President Rodrigo R. Duterte’s visit in Ilocos Region and Cagayan Valley Region to assess the damage brought by ‘Ompong’, and to visit displaced residents in evacuation centers.